LIFETIME WARRANTY: For peace of mind, this cable comes with a lifetime limited warranty. NEMA connectors are power plugs and receptacles used for AC mains electricity in North America and other countries that use the standards set by the US National Electrical Manufacturers Association. 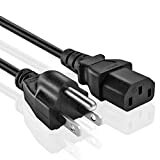 A power cord, line cord, or mains cable is a cable that connects an appliance to the mains electricity supply via a wall socket or extension cord. NEMA 5 connectors are used for commonplace domestic electrical equipment and other heavy duty or special purposes. NEMA 5 devices are three-wire grounding devices (hot-neutral-ground) rated for 125 V maximum, with the 5-15, 5-20 and 5-30 being grounded versions of the 1-15, 1-20 and 1-30, respectively. 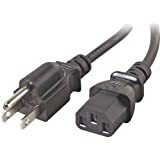 This universal power cord is designed to work with most PCs, monitors, scanners, printers and other devices and peripherals that have a removable power cord and use the 3-pin shroud power connector. All of our power cables feature fully molded design that provides maximum durability and long lasting life. COMPATIBILITY: Will fit TVs, Monitors, Game Consoles, Printers, Sport Equipment, ION Block Rocker, Block Party & Live Explorer Bluetooth Portable Speaker System and other appliances with similar plug including Samsung Toshiba LG Sharp Sony Sceptre RCA Panasonic Philips Mitsubishi Magnavox TV LCD Plasma DLP, Acer Asus HP Samsung ViewSonic Dell Compaq Hanns-G LG Planar Monitor, Screen , PS3 , XBOX 360, Acer Asrock Bowflex Epson Frigidaire Foxconn Fuel Haier Hamilton Healthrider Beach Honeywell Horizon Image KAZ Landice Nordic Optoma Proform Precor Reebok Sharp Shuttle Smooth Sole Supermicro Stairmaster Spirit Star Trac Viewsonic Weslo, Laser Printer Xerox Oki Data Brother Lexmark Samsung Hp Hewlett-packard Ricoh Canon Konica Minolta Panasonic and others. eMachines PS/2 Multimedia Keyboard Model Number: KB-9908. Keyboard Features: Black Keyboard, 104-Keys, 3 Hot Keys - Internet, Email, Search, 3 Multimedia Buttons - Volume Up, Volume Down, Mute Tilt legs for adjusting angle of keyboard PS/2 Interface, Model Number: KB-9908.